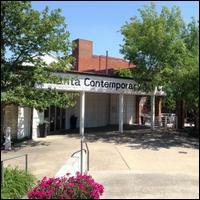 Atlanta Contemporary Art Center is located in a renovated 35,000-square-foot warehouse complex on Means Street near the Georgia Tech campus. It is dedicated to excellence, experimentation and education in all forms of contemporary art. The facility includes gallery exhibition space and is a home for the Studio Artist Program, which supports working artists by providing studio space at reasonable rates and by fostering a collaborative environment supportive of the creative process. Studios range in size from 225 to 755 square feet. Parking: There is plenty of Free parking in the lot opposite ACAC at the corner of Means Street, Bibb Street, and Bankhead Ave. MARTA: ACAC is accessible from the Arts Center MARTA station via the #113 Bus (stop number 904437), or from Five Points station via the #1 Bus.